Today Apple is set to launch the Mac App Store following the iPhone app store model for Mac applications. Mac App Store is open for business now! The store will sell Mac OS X applications both free and paid. Apple will take a 30% cut from the price. Once purchased, you can use the software in all your Macs. Mac App Store is expected to be available in 90 countries around the world at launch. 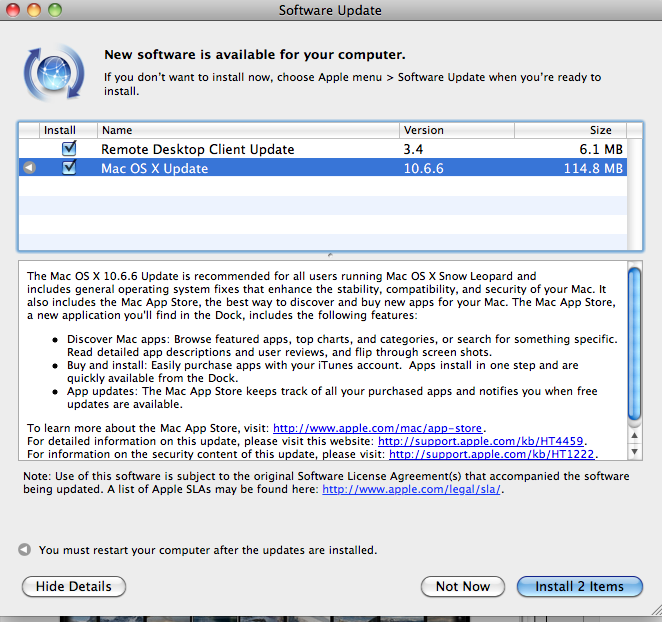 Mac App Store is available as a software update to all those running Mac OS X Snow Leopard. Just go to System -> software update to see this screen. To fix this, just sign out of App Store and sign back in. You may be asked to accept terms and conditions (I wasn’t). Now proceed to download an app. This worked for me. A Mac App Store screenshot for Tweetie for Mac has been leaked. It appears that Tweetie 2 has been renamed to Twitter for Mac and is now available at launch today for FREE. It has renamed to Twitter for Mac and is fantastic! iWork 11 to ship today? Sorry there is no sign of iWork 11 in the App Store at the moment. I will update if it shows up later today. I have a bunch of my favorite iPhone apps now showing up as Mac apps. I will be posting more about those later. Stay tuned and happy surfing!